Two years ago when I was new to the Downtown Disney team, my family visited with my then 2-year old niece. One of my first Disney Parks Blog stories was “Big Fun For Little Ones at Downtown Disney at Walt Disney World Resort.” Twenty-four months and two more kids later (my sister now has a 6 month old and an 18 month old, too! 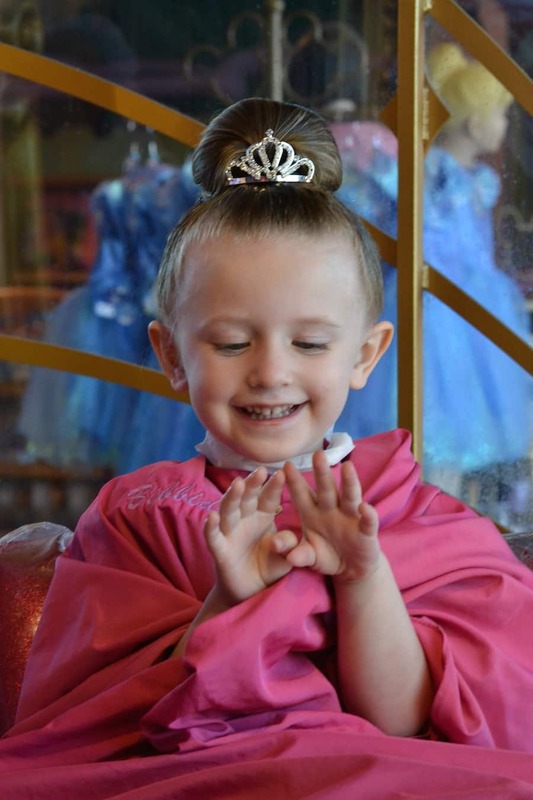 ), I’ve seen hundreds of little princesses come out of Bibbidi Bobbidi Boutique, but recently, it was finally MY little princess — my now four-year-old niece, Harper. As excited as Harper was about picking out her dress (she went with Princess Anna), she was equally as nervous about having someone brush her curly hair. For a minute, I thought we might have to cancel our appointment, and then we met her Fairy Godmother-in-training, Lydia. She was amazing! Before Harper got into the makeover chair, Lydia did a practice run to show Harper how gently she would brush her curly locks. To Harper’s surprise, it didn’t tug at all. During her princess transformation, Harper got to pick out her hairstyle (I was thrilled that she went with the ever-classy “Fairytale Princess” option), choose her nail polish color, and select her make-up shades. The finishing touches were a shimmering princess jewel for her face, a rhinestone crown for her head, and a pink Bibbidi Bobbidi Boutique sash to complete the look. When it was all over, she was invited to sign the “Princess Autograph Book” – she left her signature “H,” taking up a full page. Later that afternoon, when I asked Harper what her favorite part of the day was, she said “being with my Fairy Godmother. I hope she will always be my Fairy Godmother.” I also caught Harper looking at herself in the full length-mirror, doing a twirl, and whispering to herself “today is my princess day” when she thought no one was looking. (This is a true story. And it was as adorable as it sounds.) Finally, on our car ride home, after a full day in the parks, she told me that when she grows up she wants to be a Fairy Godmother, too. Harper left Bibbidi Bobbidi Boutique with a princess backback filled with her remaining make-up and polish, which came in handy, because she wore her Princess Anna dress three days in a row! More importantly, she left with memories that will last for years to come and pictures that will always make me smile. 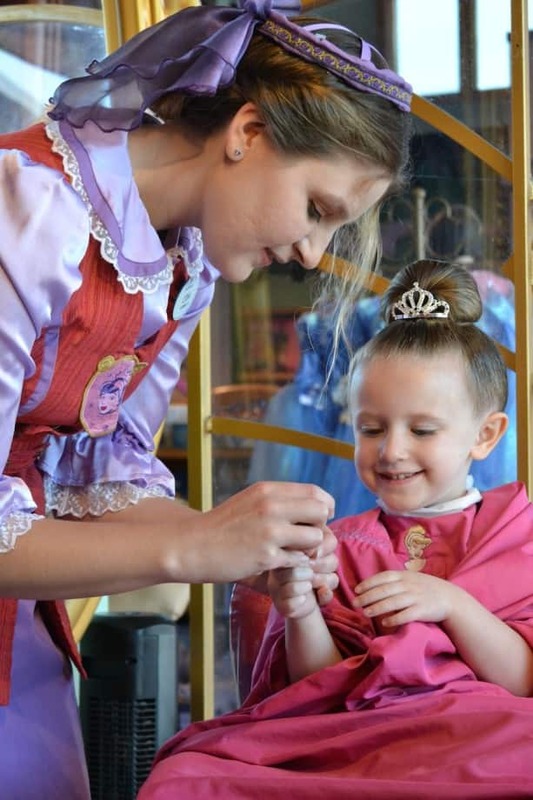 Have you taken your princess to Bibbidi Bobbidi Boutique? What was your experience like? Please share in the comments below – I hope it was just as magical as ours was! 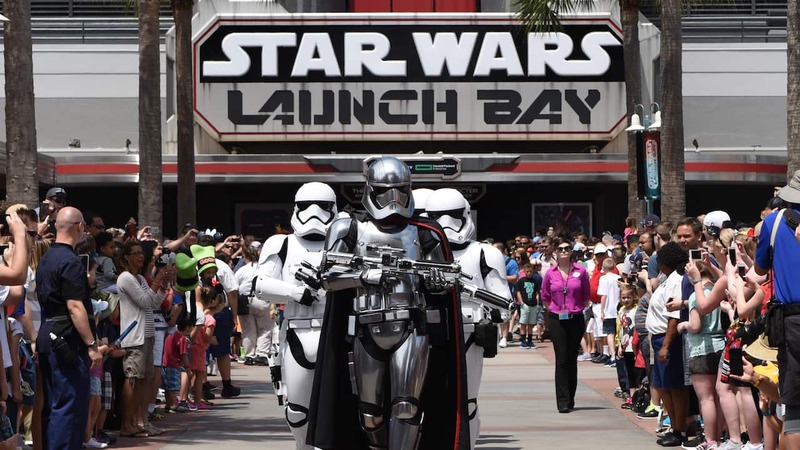 I want to have my granddaughter participate in this experience but I don’t know which theme park it takes place in. Can someone tell me which park the BBB is located in? Thank you. We took our daughter to BBB in May of 2013, she was 5 at the time. She chose to be Princess Ariel. It was the most magical day! Reagan, like Harper, commented on it being the day she truly became a princess. As a parent, I know that day holds so many wonderful memories for me… but I can only imagine what that day will be remembered as for Reagan. I can’t wait to hear her thoughts on that day as a teenager, a young adult, or a mother herself. Disney is nothing if not memory maker central! I’m happy to report we are headed back to Disney in 67 days (but, who’s counting?!) and Reagan has an appointment at BBB the first day we are in the parks. She has not decided whether she will choose Anna or Elsa, and I’m sure she’d choose both if she could. This trip is so different for us. At 5, Reagan believed the princesses were exactly who they said they were – Cinderella popped out of the screen to meet and greet our family! What magic that was! Now, at 7, she knows there is somebody dressing up as Cinderella, shaking her hand and going on to live their real life when they leave the park. But, again, that opens a whole new realm of magic – the magic of her imagination and the reality of what Disney truly brings to your heart – hope of bright days, filled with radiance, joy and happy ever afters. All with a little touch of pixie dust! My daughter did BBB at age 3 and age 5. Both times were truly magical! We did the full package at age 3, but she wasn’t into buying a new dress on the age 5 visit. We took our own Belle dress and it wasn’t frowned upon at all. I was relieved to feel no pressure on purchasing a specific package. Cassie, absolutely! I saw princesses in brand new dresses from Bibbidi Bobbidi Boutique alongside others in tutus, jeans or homemade gowns … anything goes! My daughters absolutely love this experience. I don’t think 10 is too old for this at all! Only girls 12 and under are allowed to enjoy this experience, so let them do it while they can! We are going at the end of June/beginning of July and my 11 year old asked if she could still get her makeover along with her 5 year old sister! I absolutely made her a reservation, as this may be her last time to get it done – who knows if we’ll be back next year. My girls have always brought their dresses with them, and the oldest says she is probably too big now. She may not get “dressed up” this year, but she’ll have the hair, make-up and nails done. My little one is bringing her new deluxe Elsa costume and is counting down the days! I can’t wait to see their smiles when they see themselves all done up! Cristin, I couldn’t agree more … seeing their smiles when they see their reflection in the mirror for the first time is the best part! Enjoy your visit this summer!!! Sara, if your daughter still loves all things princess, I think she’ll love this, too! We saw princesses as young as 3 and as old as 12. You can make reservations by calling 407-WDW-STYLE. Have fun and be sure to have a full memory card as you’ll want to take lots of pictures! Dustin, congratulations on your new daughter — I’m sure she is your favorite “princess,” by far! At the beginning of this month we took my niece to the Bibbidi Bobbidi Boutique in the castle and I was so shocked that this was my favorite part of the trip! It was so amazing to see her dancing around in her Anna dress with a huge smile from ear to ear. And they gave her so many things to go along with her backpack, it was well worth every penny we paid for it. She looked absolutely beautiful and felt like a princess! I have to say that her Fairy Godmother In Training that transformed her into a princess was soooooo amazing, her name was Donna and she was from Lafayette LA. She is wonderful at her job and made my niece feel so welcomed there and like she really was a little princess 🙂 HIGHLY RECOMMEND!!!! Charlesia, I thought we just got lucky with an incredibly talented Fairy Godmother-in-training, but based on your note, I think they are ALL amazing! Thanks for sharing!! !